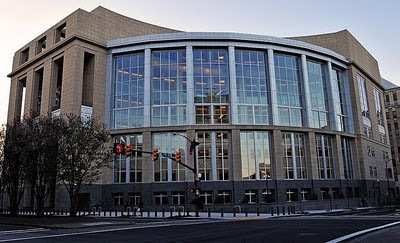 On January 25, 2011 Angad Singh, a third-year law student at the American University Washington College of Law, appeared before three judges in the Fourth Circuit Court of Appeals in Richmond, Virginia and asked them to end the government's 20 year harassment and unequal treatment of David Johnson, who automatically derived U.S. citizenship through his father, who had sole legal custody of David and naturalized when David was eight years old. UNROW's two main arguments are that the government's latest action, stemming from a 2004 ICE detainer and 2008 Notice to Appear, resulting in Mr. Johnson's incarceration in Batavia for the last two years, is violates David's equal protection right against discrimination based on his parents' marital status at the time of his birth. UNROW is arguing that the current proceedings also violate the principle of res judicata -- a need for finality at odds with the perpetual relitigation of the same issue. Judge Gregory asked the government whether they're purporting to implement a policy that punishes children for the nonmarriage of of their parents. 'In my day we called these kids bastards,' he said. The judge asked, how can you still promote this kind of view and defend this thing in court even when the statute has changed? In 2000 the Child Citizenship Act got rid of this. How can the government still have same important government interest under equal protection, how can it still be relevant? Mr. Singh is part of the UNROW Human Rights Impact Litigation Clinic and has been working with the supervising attorney Erin Louise Palmer, the Clinic director, Ali Beydoun, and several other students (including Brenda Robles and Rachel Zoghlin) on obtaining Mr. Johnson's freedom. David Johnson, now 46, was born in Jamaica and was in the sole legal custody of his father, Ronald Johnson, since shortly after his birth. His mother, who has a different last name, in 1966 signed a document indicating that she "voluntarily gave his father Ronald Johnson custody of David from the year 1965." David and his father entered the U.S. as legal permanent residents in 1972 and in 1973, Ronald became a naturalized U.S. citizen and thus, according to two immigration adjudicators in prior removal hearings (Kevin McHugh in 1992 and Jimmie Lee Benton in 1998) David derived citizenship from him at that time. Typical of cases in which foreign-born U.S. citizens are racially profiled for removal after serving prison sentences, David was, for a THIRD time put into deportation proceedings in 2004. The government is claiming that the terminations on previous occasions only indicated that the government had not proven David's alienage, not that the adjudicators had affirmed David's U.S. citizenship. (See govt. brief here.) Their substantive argument references precedents with significantly different fact-patterns (Nehme v. I.N.S. 252 F.3d 415  and also Afeta v. Gonzales, 467 F. 3d 402 ).) In these two cases federal courts held that the INS requirement for a "legal separation" applied as well to parents who had never been been married but de facto separated. In other words, the judges affirmed that Congress has the prerogative to impose on unmarried couples jointly raising children the requirement of being legally married in order to most easily effect a "legal separation." The government brief states: "The immigration judge determined that 'legal separation' under INA section 321(a) required 'a judicially recognized marital separation and, by implication, a marriage.' JA 133 (citing Afeta v. Gonzales, 467 F.3d 402 (4th Cir. 2006))." The UNROW response (see brief here), is that "A marriage requirement cannot withstand intermediate scrutiny because the governmental interests at issue cannot be advanced by the distinction between children of married and unmarried parents." DHS is precluded from relitigating Mr. Johnson‟s citizenship because Judge Benton determined this identical issue and the determination was critical to the judgment in the 1998 proceedings. The government had a full and fair opportunity to litigate the issue of Mr. Johnson‟s citizenship and chose not to pursue an appeal. Issue preclusion bars the government from relitigating the same issue that was fairly decided in 1998. See Ramsay v. INS, 14 F.3d 206, 211 (4th Cir. 1994) (applying issue preclusion against a respondent in removal proceedings where all of the elements of issue preclusion were satisfied). Citizenship was the only issue at the prior hearings. We know that from the transcripts, and it was the only cited reason in the termination order. So it must have been decided. We argue [citizenship] was the only issue in dispute and they terminated the hearing; the syllogism is complete. One additional potential problem with the government's position is that it is backed up by precedents associated with different fact-patterns than those Mr. Johnson's biography presents. 8 U.S.C. §1432(3) in effect when Mr. Johnson was born states he would derive U.S. citizenship as an operation of law when there was "[t]he naturalization of the parent having legal custody of the child when there has been a legal separation of the parents." The interpretations of this section in the cases the government cites suggest Congress contemplated situations only with both parents having de facto custody for a significant period of the potential U.S. citizen's childhood or de jure -- including the de jure parental status of an absent but legitimate father. But David Johnson's mother had neither a de jure nor de facto relationship with him, having relinquished legal and physical custody when David was an infant and having never married his father. In this scenario, one wonders whether the statute's application here fails even the rational basis test. How can the government expect a father who since the child's infancy has had sole de facto custody to have married and divorced the child's mother? It is one thing to say, okay, you parents who are living together in a common law marriage should straighten up your legal relations so they fit the facts of your actual living situation. This is of course very problematic as well as unconstitutionally discriminatory for the reasons stated in the UNROW brief. But it seems not just unequal but ludicrous for 8 U.S.C. §1432(3) to require parents to marry when one of them has relinquished legal custody of the child and the parents have no shared domicile or other arrangements between them. UNROW has a betting pool on when the Fourth Circuit, known, they tell me, as the "rocket docket," will issue its opinion. The money is on a few weeks to two months. Photo appears courtesy of a Creative Common license and was taken by Andrew Bain Taber. update 5:30 pm: "Talk of the Nation" has the link from today's segment on the opinion piece here. 1) Following the 1920 census, not only did Congress stop increasing the size of the House, they actually violated their constitutionally-mandated duty to reapportion altogether! For the first time, the census showed more people living in urban than rural areas, and legislators feared the shift, another example of how paranoia about "foreigners" causes people to themselves violate the rule of law. As Edgar J. Hoover's agents were violating the constitution's fourth and fifth amendments pursuant to deporting alleged Communists and anarchists, Congress was violating the right of all Americans to equal representation, not to mention ignoring one of the few affirmative duties the founders assigned it. In 1928, after President Calvin Coolidge threatened to veto future legislation until this was fixed, the House agreed to a formula for shifting seats around, contemplating as well an increase to 485 members. But with the 1930 census around the corner, legislators held off because they already had the formula for redistributing 435 members and wanted to avoid further delays. They never contemplated that the number would remain fixed at 435 for an entire century. 2) The actual change in representation may be more dire than the one published. That's because the original denominator includes slaves, albeit counted as 3/5 an inhabitant, and women. Of course neither could vote. The passage of the 19th amendment in 1920 doubled the size of the electorate, at exactly the time that Congress failed to increase its size and representativeness. In the event, if a civics lesson in the New York Times contributes in a small way to a national conversation about a rather glaring, and easily remediated, defect in our representative democracy that would be terrific.